Poetry isn’t hiding anymore. Isn’t gathering dust in tomes of required reading (all those heavy Norton Anthologies breaking the backs of beleaguered students). Isn’t sitting in the back row, waiting for National Poetry Month when it can, albeit briefly, dance and sing and mean more than iambic this-and-that. Poetry has a new gig. It’s bold and creative and — gasp! — commercial. Poetry sells, and that’s not so bad. I’m heartened by recent marketing efforts that play with words and invite poetry to the creative party. 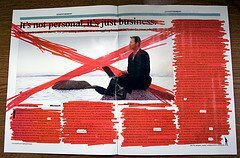 • Microsoft’s newest ad campaign features bold Blackout Poems seen in two-page spreads in dozens of national magazines this month. The form (sometimes called ‘found poetry’) has recently gained a loyal following, due in large part to the work of Texas writer and designer Austin Kleon. See his work here. • Even Safeway is going poetic. In many stores, the floral department is now clearly marked with large letters declaring Poetry in Bloom. Wallflower no more, poetry is out, loud and proud. Have you found poetry in unexpected places, from unexpected people? What poems are playing near you?